It is difficult to edit one's life, to sift through the myriad events and choose what will interest a reader. I can summarize my first twenty-one years by saying, "I got C's in art." As a biology major in college, my only drawings were of cat entrails and shark livers. I graduated with a Bachelor of Science degree and a longing for adventure. Within months, I sat in a thatched hut, surrounded by Samoans, wondering why I had ever joined the Peace Corps. My Peace Corps tour was significant, for that is where I learned to paint. I was assigned to a remote village school on Savai'i, deep in the south Pacific. My job was to teach the locals about molecular bonding and other indispensable shards of knowledge. My real job, it turned out, was to survive. As culture shock set in, as my body, mind, stomach, and bowels wrestled with this foreign land, I turned to brush and turpentine to save my sanity. Before leaving the states, I asked an art supplier to outfit me with the essentials for oil painting. "Time weighs heavily in Samoa," our training manual advised. I decided to learn a new hobby. My first painting was quite ambitious: a Samoan student dressed in a lava-lava. 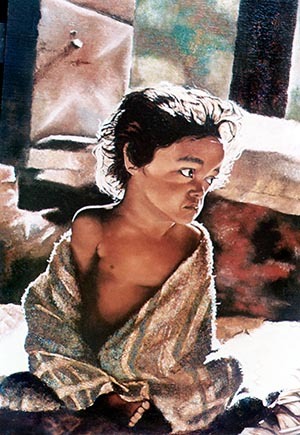 Oil paint was as foreign to him as it was to me, so there was no pressure to produce something grand. That first portrait was shades of Rembrandt at the time, but pure embarrassment today. It gave me a direction: the love of character and face. I painted only people in those days. It never occurred to me to do landscapes or wildlife (or concrete block walls!) The Samoans were frightened of my work. To see a face emerge from the canvas confused them. They sat for hours as I sketched, and they kept a respectful distance from the paintings as they dried. My palette was umbers, ochres, sienna, burnt green earth, and ultramarine deep. Since the nearest art store was 2,500 miles away, I experimented with what I had. 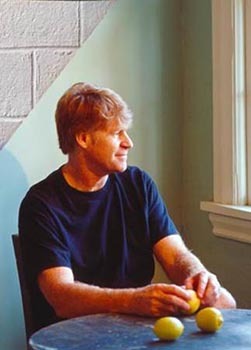 Without an instructor, my techniques evolved without the limitations imposed by "accepted practices." After two years in Samoa, I tried "being an artist" in Hawaii. The most prestigious gallery in Honolulu accepted my work, as well as 70% commission. My art, unfortunately, proved rather noncommercial. 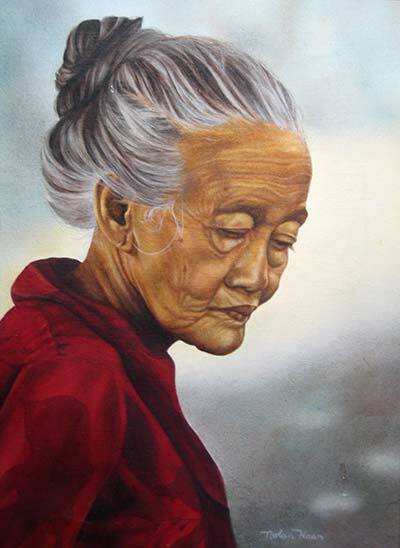 Paintings of aged Samoan ladies were not a hot ticket item. Within months I was on welfare, and soon after that I gave up my career in art. Several teaching jobs followed-Pago Pago, Iran, and Pennsylvania. But I longed to resume my art. I decided to take a couple years off, go to an exotic land, and paint. Indonesia was my choice, for it met my number one prerequisite: CHEAP. My sister joined me. Together we bicycled through the lush rice paddies and villages of central Java. 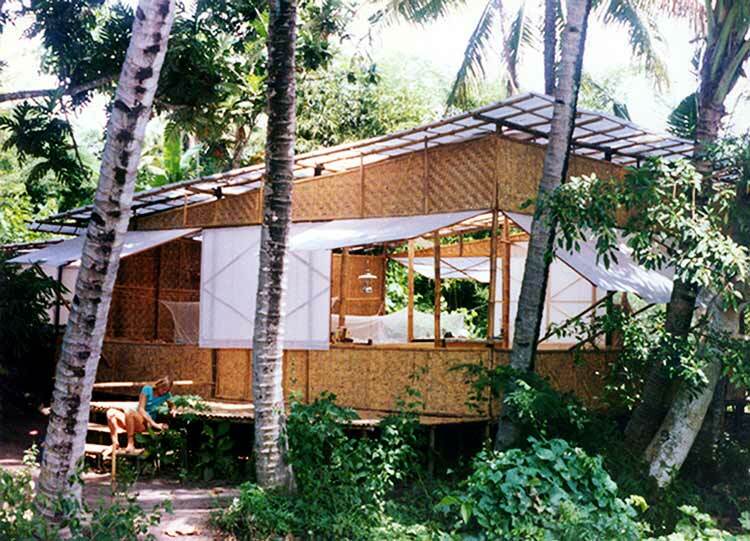 We sought a site for our Bamboo Dream House. We found a lovely plot of land, shrouded with coconut, banana, and breadfruit trees. A small stream ran through it, and a volcano rose in the distance. Best of all, the rent was only one dollar per month. For eight weeks we beguiled the villagers with our building prowess. As dozens of children watched our every hammer blow, a forest of bamboo became our home. We slept under mosquito nets, and read by kerosene lamps. We bathed in rain water collected into barrels from the roof. Our only connection with American culture was Skippy Peanut Butter. Painting in Indonesia was an audienced event. It cured me forever of being shy about painting in public. Indonesians are intense watchers (one child watched me read for two hours.) Again, I painted character studies of the villagers, my favorite being "The Tomato Lady." I experimented with glazes, using a medium of stand oil, damar varnish, and turpentine. An occasional sale to expatriates enabled us to travel to Bali, Singapore, and Hong Kong. After two years in Indonesia, I needed revaccination with American culture. My $3/week lifestyle, unfortunately, did not translate well in America. It forced me to earn some money again. For three years, art became an occasional thing. One afternoon, while I was painting at the Smithsonian in Washington D.C., a man asked if I had ever painted a duck. I chuckled to myself, thinking, "Who would ever..." Then he told me about the Federal Duck Stamp competition and the million-dollar prize. I found myself passionate for waterfowl. With only a month before the entry deadline, I decided to go for it. I had one severe limitation: no knowledge of birds. Also, in late August, the ducks at the National Zoo were molting, so I had to paint from a stuffed bird. Having read that the king eider is a handsome duck, I searched the local museums for a mount. Unfortunately, the eider at the Smithsonian is ugly and required a cosmetic overhaul. Since my forte was portraiture, I decided to compete from a position of strength by doing a head shot. I sketched and photographed the eider from many angles. But when I sat on the floor to rest, I discovered THE angle. I drew a detailed sketch and excitedly showed it to my family. They laughed. "A loser," they all advised. Without time enough to explore other options, I had to make the best of this design. The 5x7 inch format was so small that I finished the head in a few days. The background was more challenging. To be competitive, I needed to give the judges more than a bird's head. I decided to put the bird in its natural arctic habitat. To paint convincing icebergs and snow, I needed to do some field research. With camera in hand, I journeyed to...the Library of Congress. 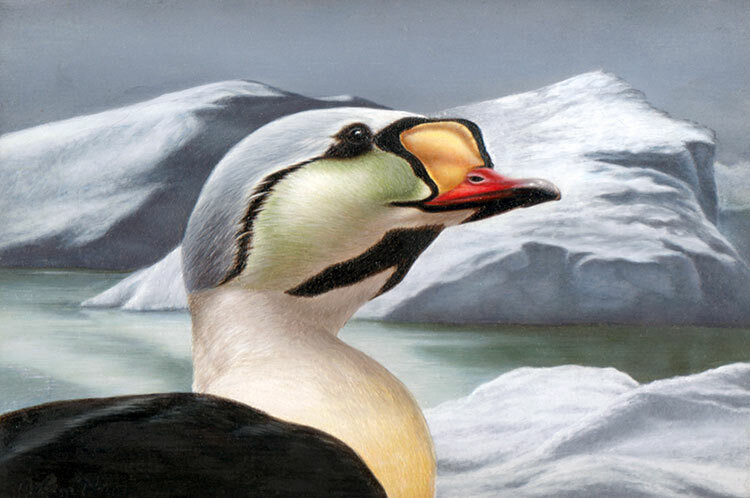 King Eider by Nolan Haan oil on panel 7 x 10"
The finished painting received mixed reviews from my friends. Most found it striking, yet odd. From a competitive standpoint (I learned later), it had three major strikes against it. A single bird, a head shot, and a king eider. Not one of these had ever won in the fifty years of Federal Duck Stamp Competitions. My entry attracted considerable attention. 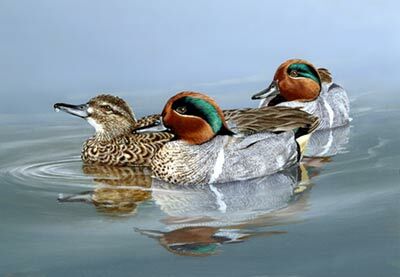 Art dealer Russell Fink told me, "I never knew why they called it a king eider, until I saw your painting. But it will not win." The eider received a perfect score of ten from four of the five judges and placed second in field of 1567 entries. The winner made $2,000,00 that year. There was no money for second place. Suddenly I was at the center of an art field I knew nothing about. When told that people count primary feathers, panic set in. "What," I asked, "are primary feathers?" Thanks to the guidance of Russ Fink, my education began. Together we traveled to Montana, Wisconsin, Canada, and Maryland shore points. We shivered in duck blinds and took thousands of photos. With Russ grooming me, my beginner's luck continued. After placing second in Maryland's competition, I won the Delaware and Nevada contests. 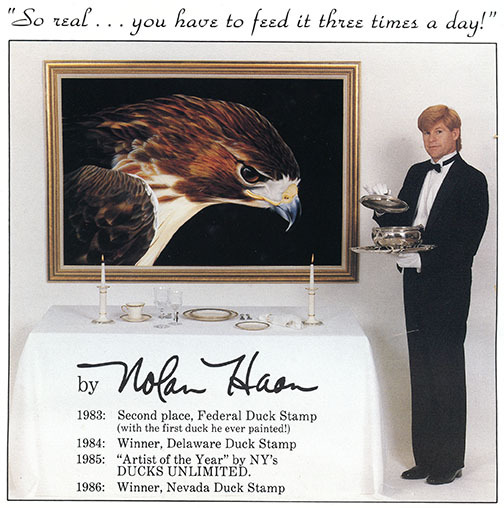 In 1985, Ducks Unlimited named me "Artist of the Year." After three years of painting miniatures, I felt it was time for a new challenge. I put aside my tiny brushes and magnifying glass and stretched a canvas five by six feet. On this surface I painted the head and shoulders of a red-tailed hawk. 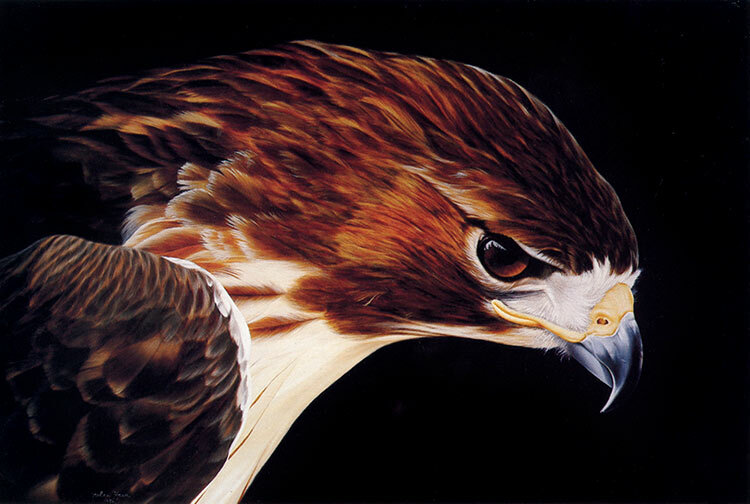 Red Tailed Hawk by Nolan Haan oil on linen 50 x 72"
The hawk showed at the Southeastern Wildlife Exposition. To be modest, it brought the house down. It received the attention every artist dreams of. It gave my sister and I the courage to form our own publishing company. We wanted to print, advertise, and market my images. Again, I entered a field knowing nothing. The hawk was a success and gave our fledgling publishing company a running start. In our first year, we released five successful prints. Unfortunately, print marketing was time consuming and nerve wracking. I wanted to paint without the pressure to print or sell anything. I wanted to experiment with several ideas that were percolating in my head for too long. After ten years, I wanted to leave wildlife art. 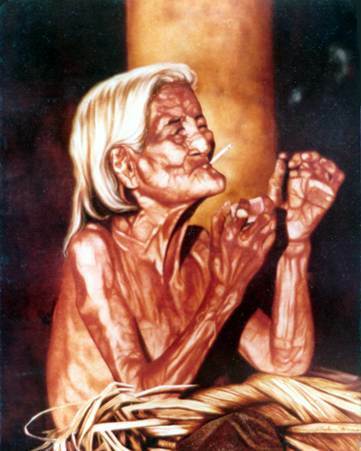 Inspired by my artist friend, Carlos Cobos, I longed to enter the contemporary art scene. I needed a concept, something new and exciting. 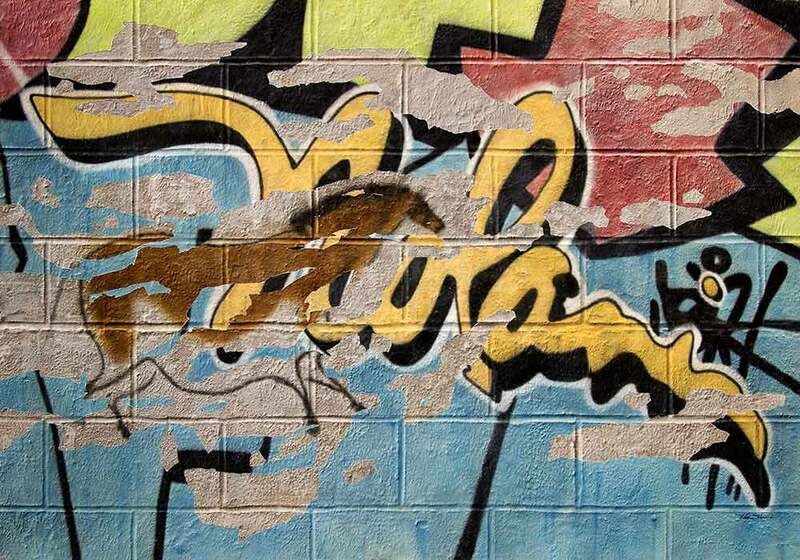 One day, while sitting in my basement studio, I stared at the paint-spattered walls. 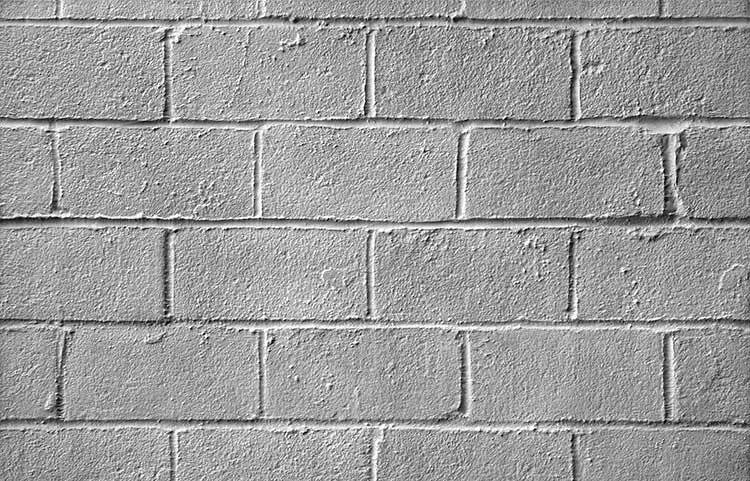 I fell in love with the pits, and scratches and ill-applied mortar. "If you could take that wall and hang it in a modern art gallery," I thought, "it would fit right in." Why not paint a picture of a concrete block wall? I had found my muse. Basic Gray by Nolan Haan Acrylic on Silk 50 x 72"
The challenge to paint a convincing cement took me six months of experimenting to solve. I paint on silk charmeuse. Because its surface is smooth, the illusion of cement is not compromised by the texture of fabric. I use brushes, rubbing, and spray paint to transform the luxurious fabric into cement. I use NO computer, image transfer, printing, silk screen, or photographic techniques. Concrete block walls are the ideal subjects. They have stories to tell, but they don’t fidget and ask for a coffee break. With some coaxing, they evoke sadness, tell jokes, or comment on the human condition. Some pay homage to early masters. 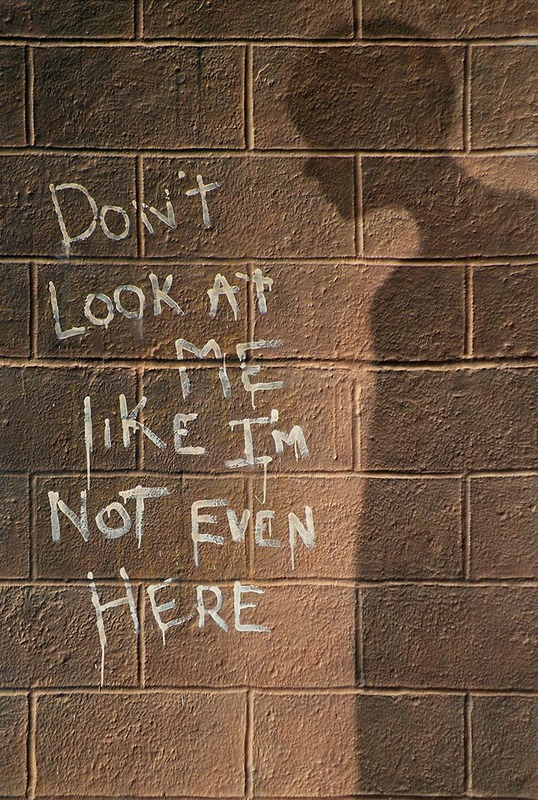 Others display contemporary graffiti or prehistoric cave art. Each strives to elicit a reaction and establish a relationship with the viewer. 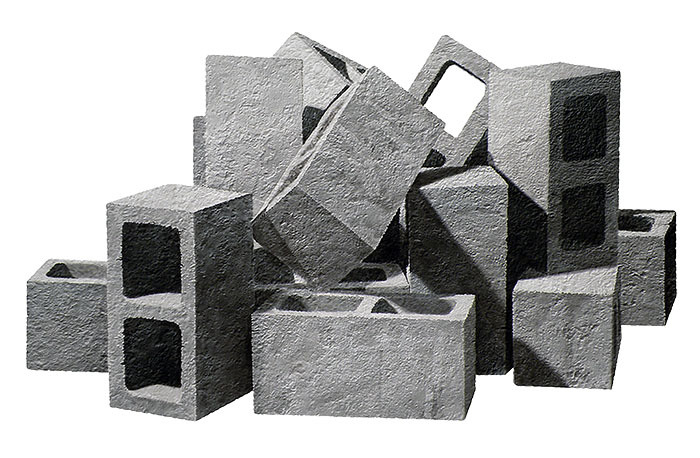 I enjoy the sculptural quality of individual concrete blocks, often rendered larger-than-life. I glue the painted silk onto hardboard panels, which I cut to the exact shape of the concrete block. This gives the illusion of floating blocks of cement. I love to experiment with the subtleties of surface texture, of mortar and stucco. The variations seem endless. My family was less than thrilled with my new "modern art kick." They thought I had gone completely mad. 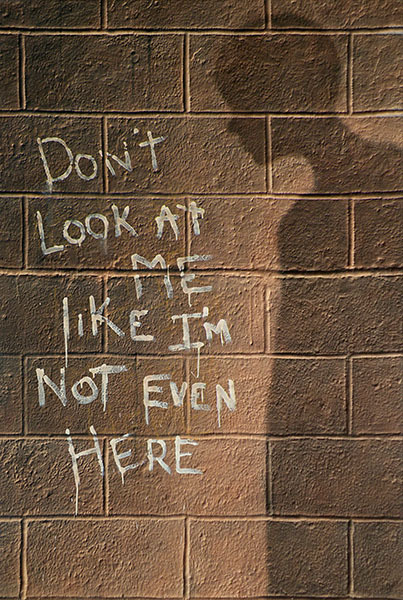 After a while, cinder block paintings filled my entire home. One day, while walking down the street with my mother, she pointed and said, "Now there's an interesting wall." I was making headway after all. 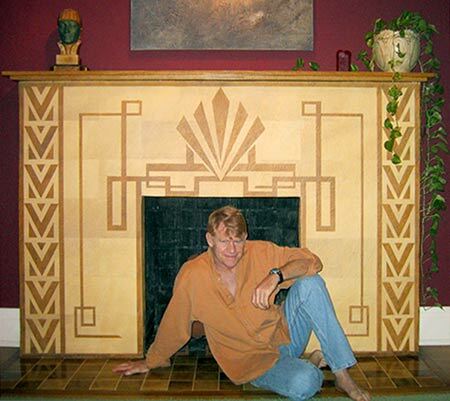 Paintings of cinder block walls became my obsession, but in 1989 my life took a major turn. 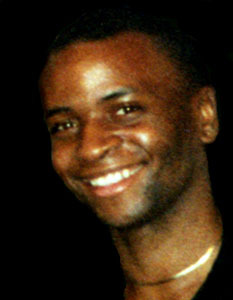 David Williams, my long-time partner, was diagnosed with AIDS. For three years we struggled with his illness, until he passed away at the age of thirty-five. My art career, no longer important to me, sputtered to a halt. After David's death, I ignored the advice of friends against doing anything drastic. 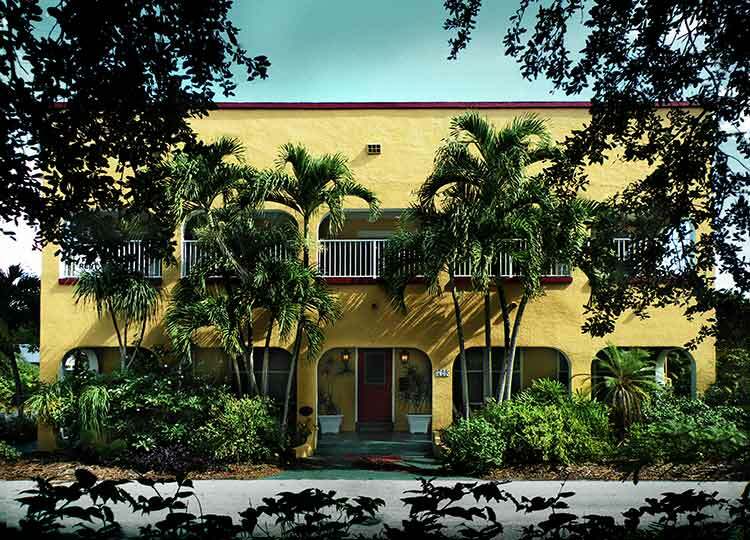 I bought a sixteen-unit historic apartment building in Fort Lauderdale, Florida. I became a landlord. Located in a neglected area of town, the price was low. The building was a mess, but my resolve was high. Armed with a one percentile mechanical aptitude, I began renovating the "Half Moon Inn." The next five years brought evictions, death threats, burglaries, and an arson fire. But, apartment by apartment, the building transformed. One day, while I swept the front porch, a friend pulled up. "They're demolishing a historic house," she said. "Do you want to check it out?" Thinking I could salvage some old door knobs, I said, "Sure." That morning marked another major pivotal moment in my life. The buzz was that the house would be free to anyone willing to remove it from the site. Since I owned a vacant lot across the street from my apartment building, I thought, "Hmm..." The city owned the house and put it up for bid. After some quick research on the cost of house moving, I put in a negative bid. Everyone thought I was crazy, that the city commission would laugh at me. But guess what? I got the house plus $55,000 in cash, enough to pay for the relocation and the foundation. Do you hate me yet? 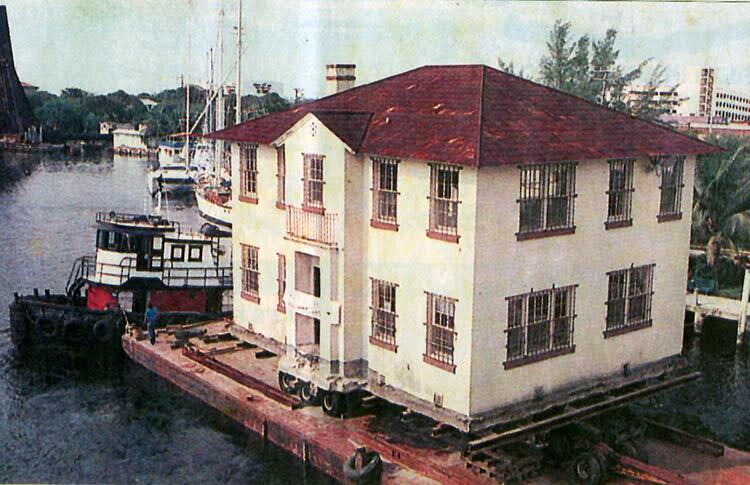 The house, a two-story colonial, weighed too much to traverse the bridges to get to my neighborhood. I had to find an alternative route. There was only one option: we floated it up the river on a barge. I won't go into all the details--that will cost you a dinner. Suffice it to say that the three-day journey was the most amazing weekend of my life. Getting it on and off the barge, up the streets, and positioned on the lot was miraculous. I still can't believe it happened. There were helicopters, television crews, reporters, and crowds of onlookers. Telephone/tv/cable/electric crews were taking down their lines as the house inched up the street. Tree limbs cut; streets blocked; street lights removed. Oh, Nolan, what have you done? With the house on its foundation, my real work began. I decided to make this a life project by learning all the trades and pulling owner/builder permits. I did all the renovation work with a single helper, my partner Mitchell Lambert. We went to the library and got books like "How to wire a House" and "Installing Tile." (pre Youtube). We scraped every piece of molding to the bare wood. We refinished all the hard wood floors, and put in all new plumbing and electric. We installed toilets, sinks, and showers. We did faux finishes, glazed windows, and landscaped the property. And yes, I'm bragging. Voila. My masterpiece. An over-achievement. Serendipity (what if I hadn't been sweeping the porch?) It was my Peace Corps experience, where we had to face the fear of the unknown, that gave me the guts to take on this project. I never felt I knew what I was doing. I always felt out of my element. But I did it anyway. That's what I'm most proud of. 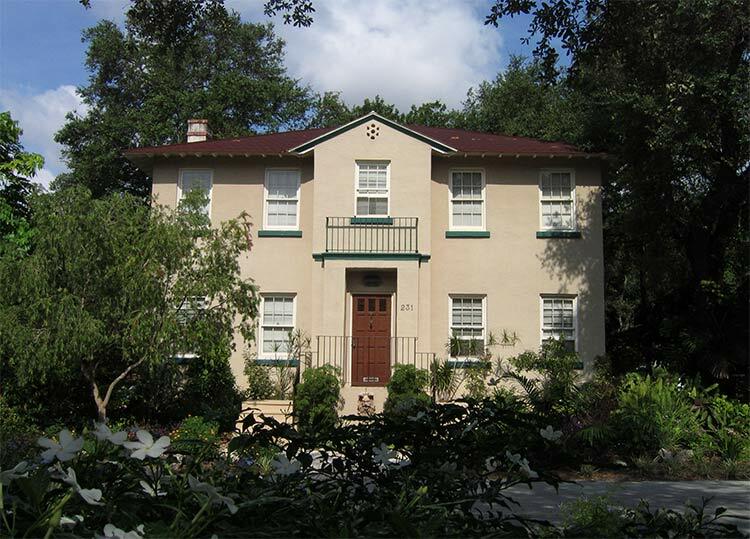 My historic renovation career continues, but at a slower pace. We are restoring a cottage, to be my future art studio. As this phase of my life closes, I again feel drawn to the art world. I converted one of the apartments into a studio and have resumed my cinder block series. It feels like a new beginning, and I'm curious where it will take me. Thank you for visiting my website. Please grab a cup of coffee and look at more of my artwork. I hope you bookmark and return often. Much love. It is difficult to edit one's life, to sift through the myriad events and choose what will interest a reader. I can summarize my first twenty-one years by saying, "I got C's in art." As a biology major in college, my only drawings were of cat entrails and shark livers. I graduated with a Bachelor of Science degree and a longing for adventure. 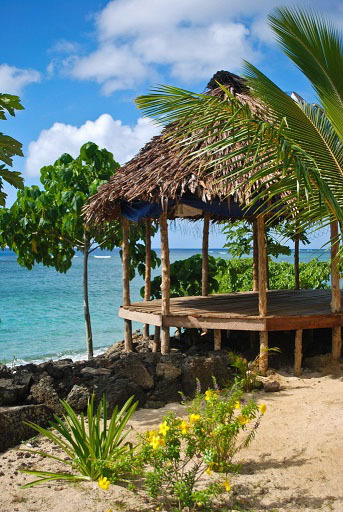 Within months, I sat in a thatched hut, surrounded by Samoans, wondering why I had ever joined the Peace Corps.